Archaeologists have discovered a previously unknown necropolis from the late pharaonic and early Ptolemaic periods in Minya, 150 miles south of Cairo. Burial grounds have been found in the area before. 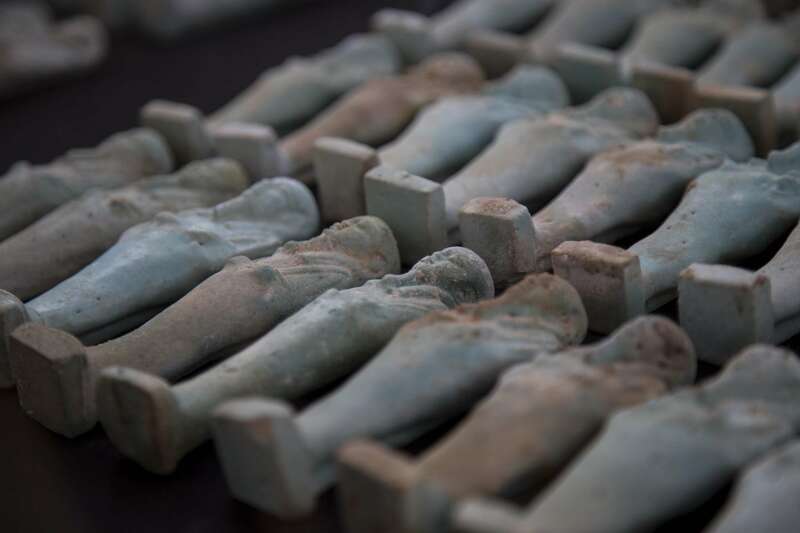 Late last year, archaeologists embarked on an excavation with the aim of discovering the rest of the necropoli at Minya, and soon struck paydirt. They unearthed tombs of priests of Thoth, inventor of writing, god of wisdom and the patron deity of the 15th nome (province) of Upper Egypt, known as Khmno, and of its capital city Ashmounin. They also found burials of the priests’ family members. One of the tombs belonged to a priest identified in the hieroglyphics on his canopic jars as Djehuty-Irdy-Es, a Haras Sa Aissa, meaning one of the Great Five, a title reserved the senior priests of Thoth. 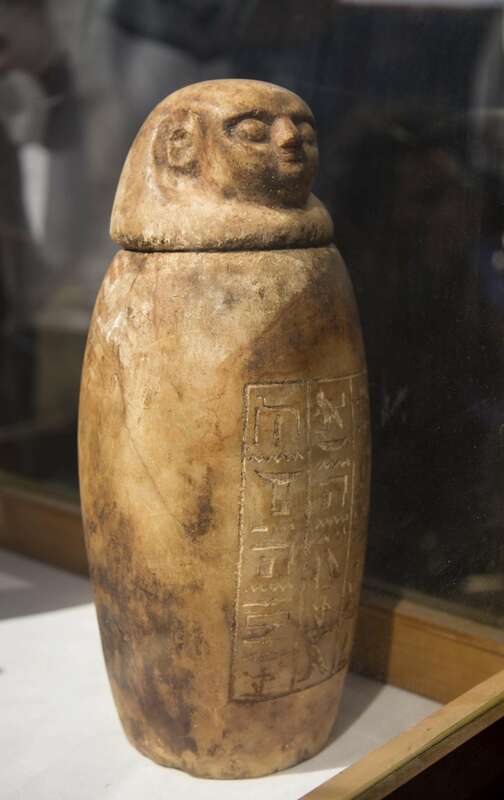 The four alabaster canopic jars, all in excellent condition, still contain the remains of the deceased’s mummified organs. Their lids represent the heads of the sons of Horus. 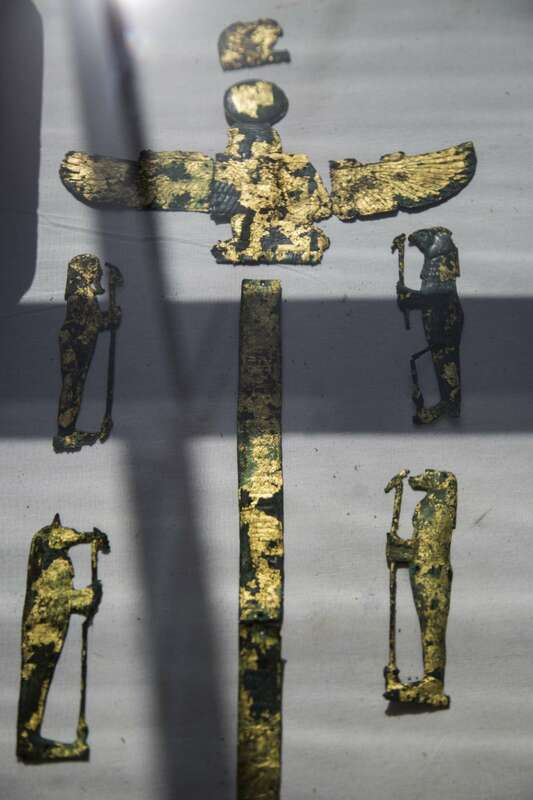 The priest’s mummy was found wearing a gilded bronze collar depicting the winged sky goddess Nut. The mummy is decorated having a collection of blue and red beads as well as bronze gilded sheets, two eyes carved in bronze and ornamented with ivory and crystal beads. That amulet, a scarab, was discovered on New Year’s Eve in what is either a fortuitous coincidence or a sign that the ancient gods aren’t quite dead yet. The mummy is in a relatively good state of preservation but has suffered some moisture damage. A large group of people, likely the priest’s family, was buried close by. 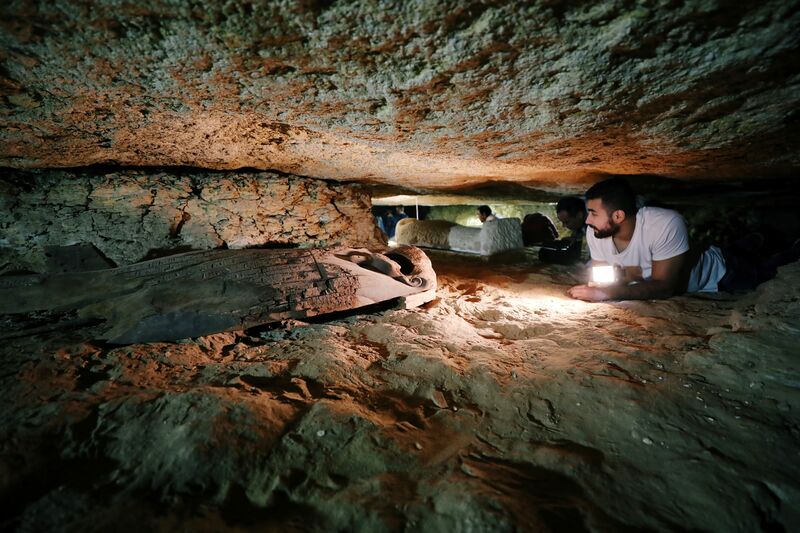 The sarcophagi of 40 family members were found in the tombs. 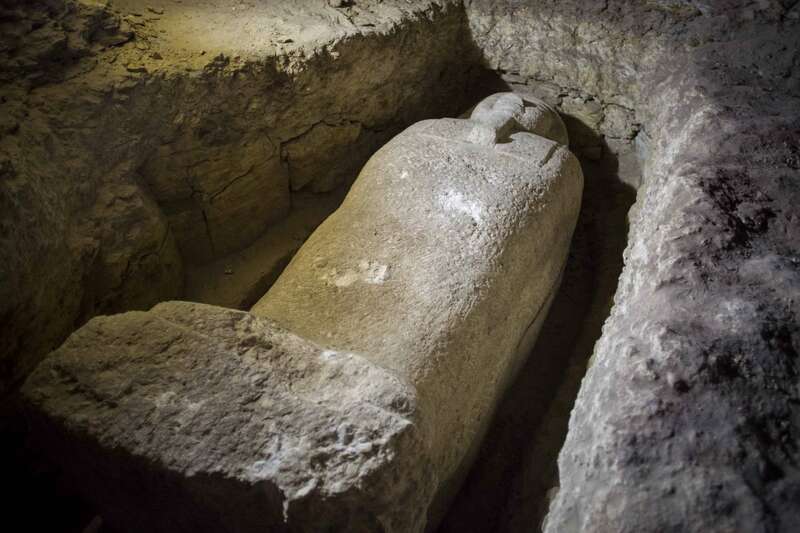 These are very high quality, expensive limestone coffins, many of them anthropoid and engraved with hieroglyphics that include the owners’ names. All told, so far the team has explored 13 burials. 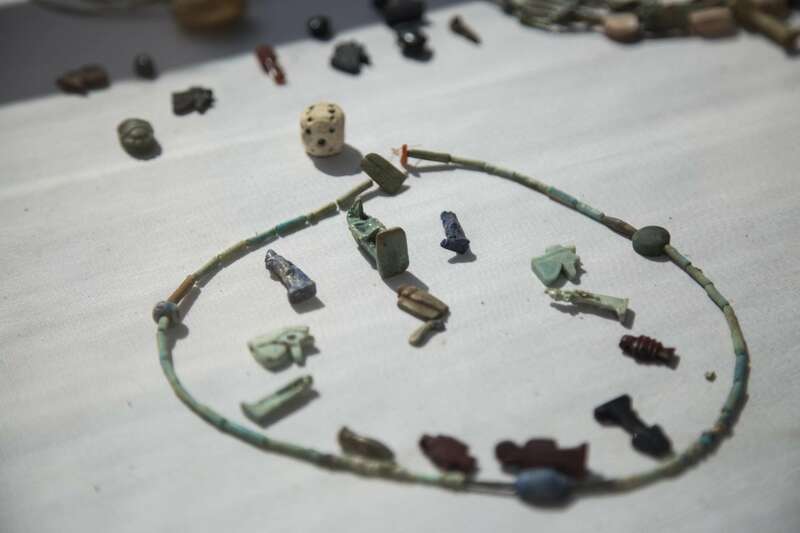 In these other tombs archaeologists have found more sarcophagi, statuettes, pottery and other funerary artifacts, including more than a thousand intact faience ushapti figurines plus hundreds more broken into pieces and the excavation is far from over. According to Antiquities Minister Khaled al-Anani, the density of finds is so significant that it will take at least five years to fully excavate the necropolis.